There’s great weather forecasted for this Saturday. We suggest you head to Marquette Park and the Thomas Dunn Learning Center for some fun and education! We hope you can take the opportunity to attend one or both of these events, but if you’re unable to make it this Saturday, please keep in mind that the Thomas Dunn Learning Center hosts numerous classes and events as well as offering open computer lab and art studio times. Check out their calendar and take advantage of this amazing resource right here in our neighborhood! September’s So Fresh, So Clean, So Creative workshop is on the topic of healthy homes. You’ll learn how to make environmentally-friendly and budget-friendly household cleaners that will help you stretch a dollar and avoid the harsh chemicals found in store-bought cleaning products. Bring along an empty spray bottle or two and go home with some of your own cleaners. The workshop starts at 11am. 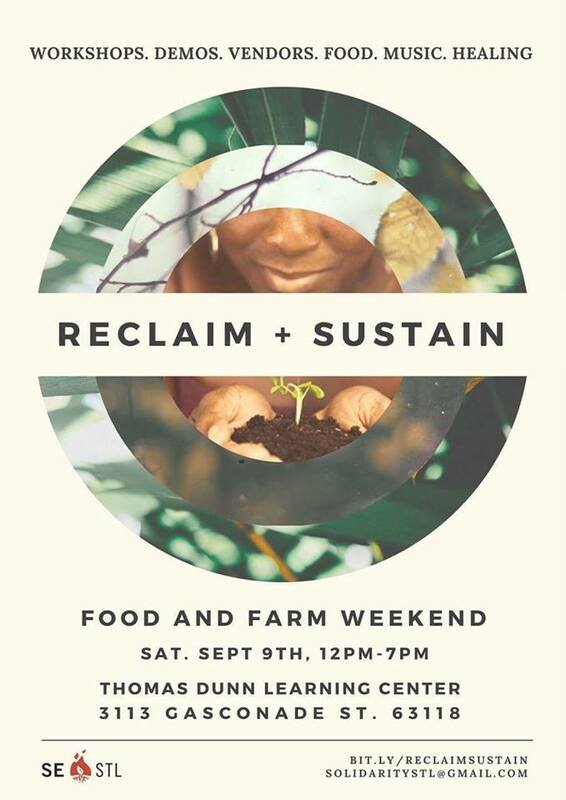 The first Reclaim + Sustain festival is from noon until 7pm and is organized by Solidarity Economy St. Louis. Reclaim + Sustain seeks to bring people together around the belief that everyone should have access to healthy, affordable, and locally-sourced food. Enjoy food and music and check out family-friendly workshops and demonstrations on growing your own food, healthy eating, cooking, juicing, and more! This post was updated on September 17, 2017 . Read more news about Classes, Dutchtown, Dutchtown Events, Dutchtown South Community Corporation, and Festivals.